In addition to providing a safe and stable supply of almonds, California's community of more than 6,800 almond farmers is committed to using sustainable agricultural practices1 that are economically viable and based on scientific research, common sense and a respect for the environment, neighbors and employees. 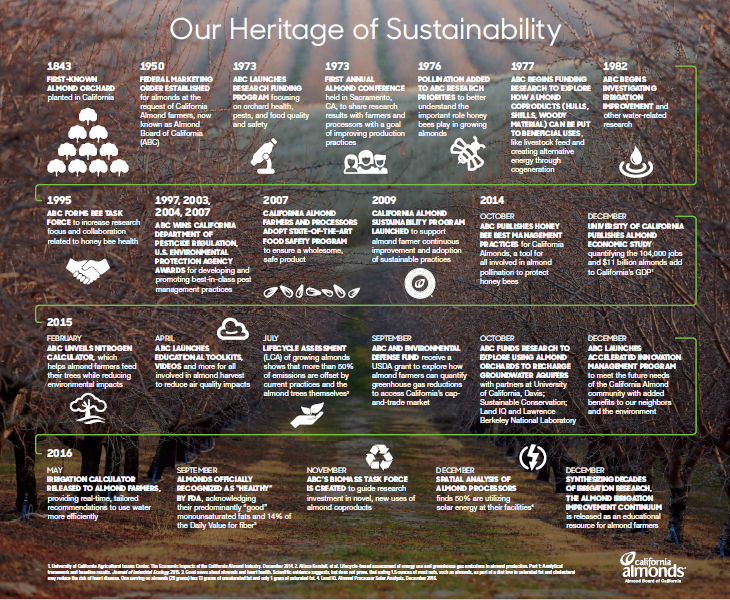 Sustainability for California Almonds connects with all aspects of the almond lifecycle, inside the orchard and beyond. In addition to growing a healthy food that is good for people, California Almond farmers are working to continuously improve their practices in a way that’s good for communities and the planet. Since 1973, the California Almond community, through Almond Board of California, has supported $80 million in research across almonds’ impact on human health, ensuring food quality and safety, and improving farming practices while minimizing environmental impacts. This has built a foundation of continuous improvement that’s helping almonds to be an economically, environmentally, and socially responsible crop for California. By partnering with the University of California, USDA’s Agricultural Research Service, Environmental Defense Fund and others, the California Almond community is exploring new technologies and out-of-the-box solutions that address farming needs today while helping to build the almond orchard of the future. The Almond Board’s Strategic Ag Innovation Committee sets strategic direction for this research, supported by working groups that specialize in distinct areas of almond farming and processing. 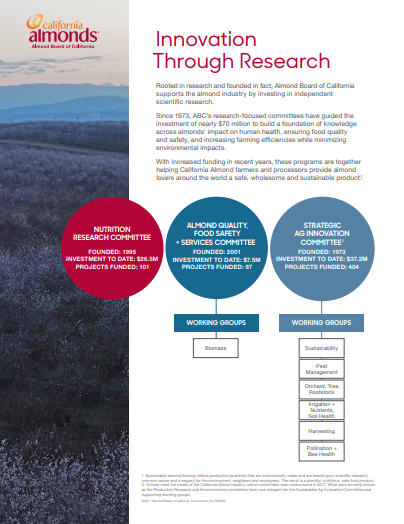 Together, these groups solicit and evaluate research projects to meet the needs of the California Almond community while benefiting local communities and the environment. 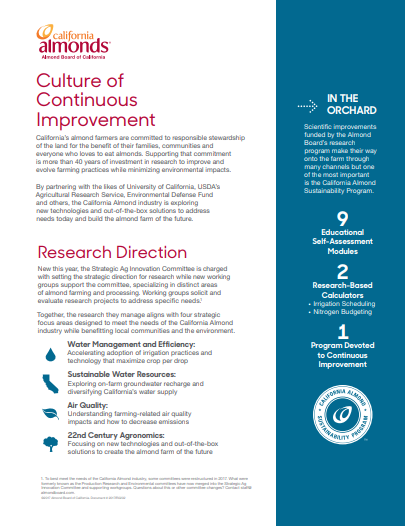 To support on-farm improvements, Almond Board of California translates research findings into actionable and field-ready recommendations shared with farmers and processors through a variety of educational resources, field workshops and best practices. In addition to topical resources, almond farmers and processors participate in the California Almond Sustainability Program. 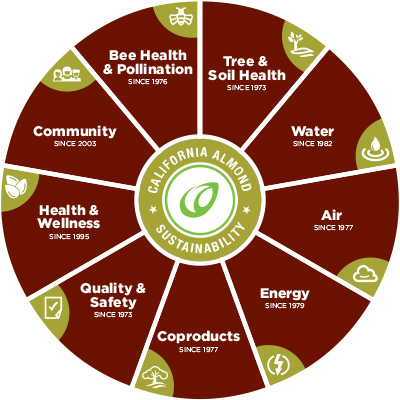 Established in 2009 and tailor-made to educate participants about sustainable farming practices while facilitating continuous improvement, 23% of California’s productive almond acreage has been assessed to date. Through self-assessments, participants learn about best practices across the spectrum of almond farming topics and share information to help tell the story of how California Almonds are grown. 1. Sustainable almond farming utilizes production practices that are economically viable, and are based upon scientific research, common sense and a respect for the environment, neighbors and employees. The result is a plentiful, nutritious, safe food product.